Though the inclusion of five Kansas City Chiefs players is sure to raise some eyebrows. 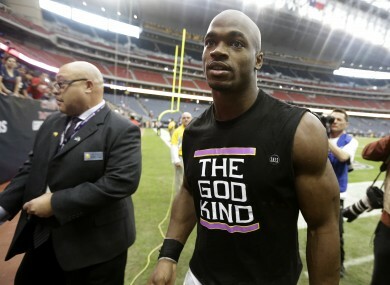 Adrian Peterson caps off an incredible comeback season with a Pro Bowl appearance. TWO COMEBACK PLAYERS, Peyton Manning and Adrian Peterson, both want to cap their sensational comebacks with Super Bowl appearances. For now, they can be proud of Pro Bowl spots. “I know there’s great players out there in the NFL, but there’s some great players on this team this year that deserve to go,” said Manning, whose 12th Pro Bowl is a record for quarterbacks. He ranks fourth in league passing this year, has thrown 34 touchdowns and 11 interceptions. Four other Broncos made the AFC roster: DE Elvis Dumervil, linebacker Von Miller, CB Champ Bailey and tackle Ryan Clady. Bailey’s 12th appearance is a record for defensive backs. Minnesota’s Peterson tore up his left knee on Christmas Eve last year, underwent major surgery, then was back for the season opener. He’s gone from uncertain to unstoppable, running away with the rushing title with a career-high 1,898 yards and lifting the Vikings toward an NFC wild card. Griffin is one of three rookie QBs who had superb debut seasons, along with Andrew Luck of Indianapolis and Russell Wilson of Seattle. Luck and Wilson weren’t voted to the Pro Bowl by players, coaches and fans, although their teams are in the playoffs; Griffin can get to the postseason if Washington beats Dallas on Sunday. The AFC kicker is at the other end of the spectrum: Cleveland’s Phil Dawson earned his first selection in his 14th NFL season. Johnson broke Jerry Rice’s single-season yards receiving record and has 1,892 yards with a game left. The league’s top two sackmasters, DEs Aldon Smith of San Francisco and J.J. Watt of Houston, were first-time selections. Watt has 20 1-2 sacks, one ahead of Smith; the NFL record is 22 1-2. Email “Comeback kids Peterson and Manning lead Pro Bowl nominees”. Feedback on “Comeback kids Peterson and Manning lead Pro Bowl nominees”.